The Ohio auctioneers best known for their association with the Blooded Horse Sales Company, were shot to death near Penn State University. 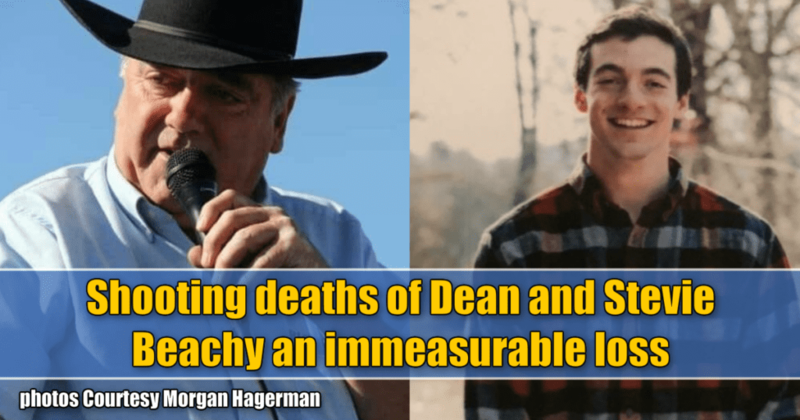 Morgan Hagerman said the shooting deaths of auctioneer Dean Beachy and his son, Stevie, has dealt an immeasurable loss to the Ohio horse community. “People in the horse industry in our area will have to find a new normal because Dean was involved in almost every aspect. Nothing will be the same. He will be truly missed,” said Hagerman. Dean, 62, and Stevie, 19, of Millersburg, OH were killed after a gunman opened fire Thursday night (Jan. 24) at P.J. Harrigan’s Bar & Grill in State College, PA near Penn State University. Dean was killed at the scene and Stevie died in hospital on Friday. The gunman also wounded 21-year-old Nicole Abrino at the bar and then fled, breaking into a home where he shot and killed 83-year-old George McCormick. The gunman then killed himself. There was no definitive word at press time as to a motive. Dean, who had many roles in the standardbred industry — including owner, trainer and driver — is perhaps best known for his work as an auctioneer with Dean Beachy & Associates which has had a long association with the Blooded Horse Sale Company. He also worked sales for the Standardbred Horse Sale Co. and Tattersalls. Dean and Stevie were in State College, PA for an auction just three days after Dean bought two horses at the Tattersalls January Mixed Sale at the Meadowlands. “Dean was a excellent man in all facets of the auction business,” said Tattersalls’ sale manager David Reid. “He was terrific to have around the sales ring, as a bid spotter, a buyer or a seller — and had the talent and knowledge to do all three at once. He had a great feel for the marketplace as well as the players and was a great resource of knowledge to me as it relates to the trade of horses. Hagerman said Dean was one of the greatest men she’s ever known. Dot Morgan, who handles publicity for the Blooded Horse Sale, said Dean was, “one of the most incredibly gifted people I have ever had the privilege of knowing. There are no words to adequately express this loss… He was so talented and beloved, yet so humble. He never hesitated to help, to give of his time, money, wisdom and experience. Jerry Haws, sale manager of the Blooded Horse Sales Company, said the word that best describes Dean is: good. “He was a good auctioneer, a good friend and just a good man who would help anyone who asked him to,” Haws said. Dot Morgan said when her youngest granddaughter asked for a white pony for her birthday, “Dean immediately volunteered their family pony, Smokey” that had helped raise all four of Dean’s sons. Morgan said Stevie was quickly becoming part of the family business that includes his brothers Bobbie and Davie who worked as bid spotters. As for Dean, Morgan said he was a world-class multi-tasker. “In the middle of negotiating a deal, Dean could simultaneously answer a child, text a message, acknowledge a friend and never forget to dot the i and cross the t. He had the energy of three men and could multi-task like a group of women. He was infectiously upbeat and positive, making a point to find and express the blessings amid the daily difficulties and challenges. Dean will always be a bright light that graces our memories,” Morgan said. “He reminds me of a phrase from a song in the Sound of Music about the singing, dancing nun Maria. There is a stanza that ends with, “how do you hold a moonbeam in your hand?” Dean could be the male equivalent of Maria. For those that knew him, his ever-ready, beloved, rhythmic chant is etched in our memories forever. He could turn it on and off like a switch. An obituary in the Daily Record of Wooster, OH (available here) said Dean is survived by his wife, the former Linda Meader, whom he married September 21, 1991. Also surviving are three of his children Robert Joseph Beachy, Benjamin Dean Beachy and David Albert Beachy, all from Walnut Creek, 2 sisters Wilma Mae (Daniel) Yoder of Medina, NY, Diane Sue Beachy of Walnut Creek and a sister-in-law Esther Beachy of Winesburg. Funeral services for both Dean and Stevie will be held Tuesday Jan. 29, 2019 at 11 a.m. at the Mt. Hope Event Center in Mt. Hope with Pastor Don Hamsher officiating. A private burial will be held prior to services. Friends may call at the event center Sunday from 5 to 8 p.m. and Monday from 2 to 4 and 6 to 8 PM. Smith-Varns Funeral Home in Sugarcreek is handling the arrangements. To share a memory, please visit the funeral home’s website. In lieu of flowers, contributions can be made to Walnut Creek Mennonite Missions Program (330-852-2560).